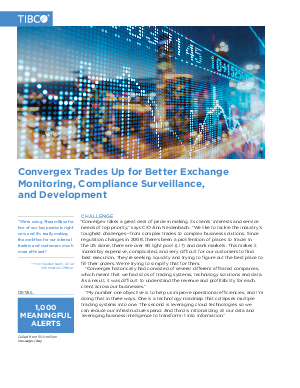 “Convergex takes a great deal of pride in making its clients’ interests and service needs of top priority,” says CIO Ann Neidenbach. “We like to tackle the industry’s toughest challenges—from complex trades to complex business solutions. Since regulation changes in 2008, there’s been a proliferation of places to trade. In the US alone, there are over 50 light pool (LIT) and dark markets. This makes it incredibly expensive, complicated, and very difficult for our customers to find best execution. They’re seeking liquidity and trying to figure out the best place to fill their orders. We’re trying to simplify that for them.